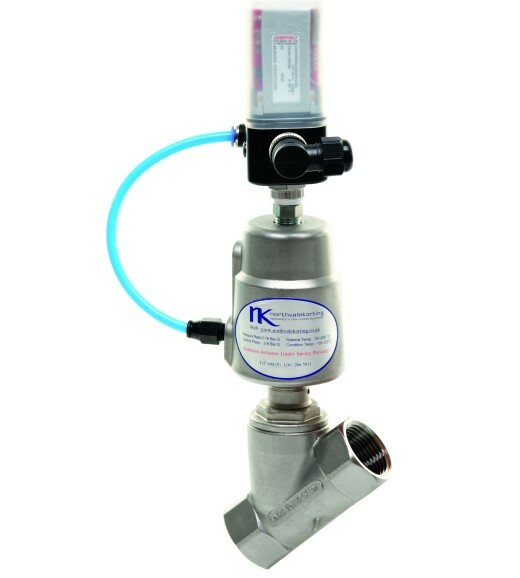 Northvale Korting has expanded its range of angle valves - 2-way pneumatically actuated valves designed and manufactured to be ideal for a number of applications, some of which may call for the control of aggressive media. The manufacturing firm has introduced modulating angle valves to its portfolio in response to customer request and global distributor feedback. These Angle seat valves allow for high flow rates, and can operate with high temperature and high viscosity media and from zero differential pressures. Speaking at his facility in Leicester, Managing Director Stephen Wright, says: "We have offered angle valves as part of our product range for a number of years but of late customers have also been asking us to apply our manufacturing expertise to the development of a range of modulating angle valves. Sometimes referred to as air-operated angleseat valves or externally operated valves, angle seat valves are operated by a pressurised pilot medium, often air. The valve features a pneumatic actuator. The pilot medium flows into the actuator cylinder under pressure and causes the piston to act so that the seat seal opens or closes permitting or prohibiting flow.